Julia and Brandon's wedding was featured yesterday. Today’s post is all about the unique details. 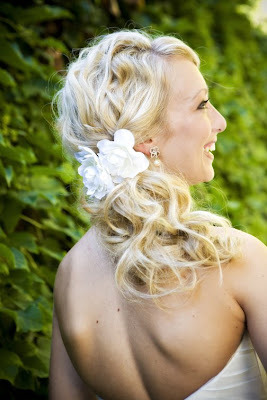 Julia wore two gardenias in her hair. 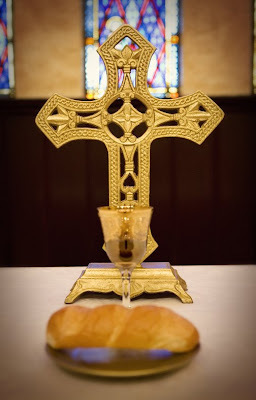 The bride’s family provided the cross, cup and plate used during the wedding ceremony. 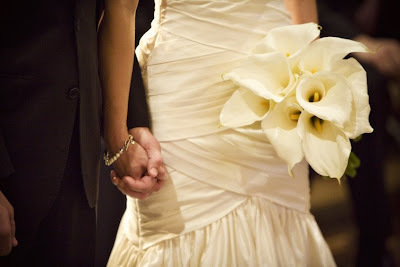 Julia’s calla lily bouquet was simple yet stunning. It really complemented her dramatic gown. All flowers by Julia Rosa. 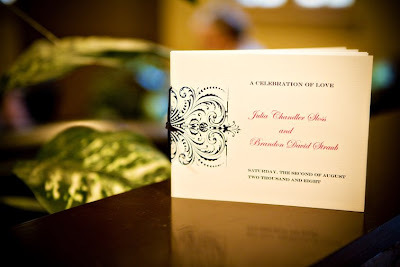 Julia designed elegant programs in the navy and dark pink color scheme. The bridesmaids’ bouquets were made of green hypericum berries, steel grass, ti leaves and an artichoke. 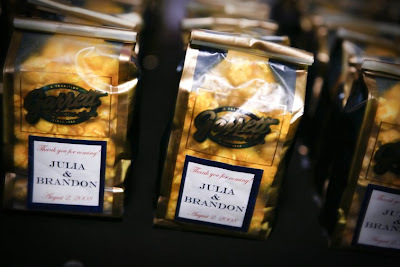 Julia and Brandon gave Garrett's Popcorn, a Chicago favorite, to guests. They created coordinating labels thanking everyone for coming. The reception at Hotel Sax. 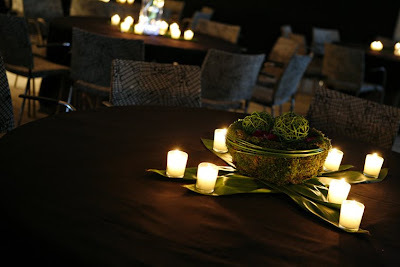 The centerpiece includes moss, ti leaves and raspberry orchids. I love how the candlelight creates such an intimate feel to the space. I love her bridesmaid dresses. That is the exact color I've been trying to find for my wedding....would you happen to know where she got them and what the name of the color is? thanks! Ann Taylor has bridesmaids dresses that color right now. Both the bride's dress and the bridesmaids' dresses were from Watters. The color is "Azalea".